Happy Valentine's Day! 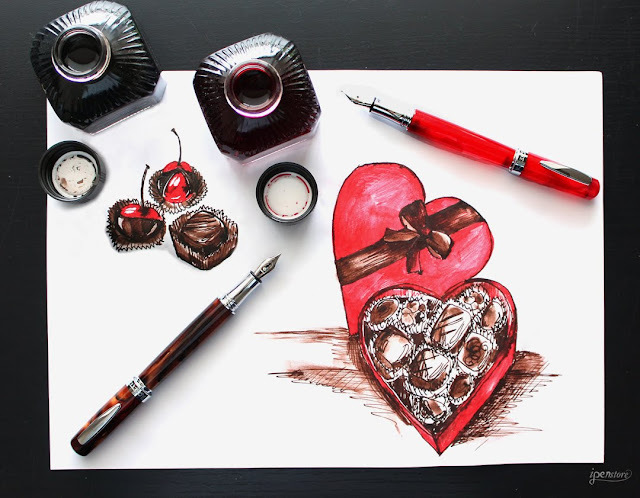 Our artist April drew a box of chocolates in a red heart satin box using Diamine Fountain Pen Ink in Passion Red and Chocolate Brown. Diamine Passion Red ink is a true red when used from a broad nib. When used with a fine or medium nib, it is more of a pinkish red. We have found that it it darkens slightly as it dries. Diamine Chocolate Brown is a golden brown. The color is very rich without any other hues mixed in. We think it's the perfect brown! These Diamine inks are very smooth and dry quickly. The fountain pens pictured are the Rosetta Napoleon II Pocket Fountain Pens in Marble Red and Tortoise Shell. Rosetta is iPenstore's own brand and we designed the Napoleon II to be pocket sized when capped at 4-1/2 inches - just the right size to fit into your pocket or purse. With the cap posted for writing, the Napoleon is a full-sized 5-3/4 inches. The nib on the fountain pen is a very high quality #5 nib made for Rosetta by JoWo of Germany and we offer them in Extra Fine, Fine, Medium, Broad or 1.1mm Italic nib. The Napoleon is equipped with a Private Reserve Velvet Black international-size ink cartridge for smooth ink flow. This pen is available in eight beautiful colors- click below to link to the selection in our store.